The ballet The Afternoon of a Faun (French: L'Après-midi d'un faune) was choreographed by Vaslav Nijinsky for the Ballets Russes and first performed in the Théâtre du Châtelet in Paris on 29 May 1912. Nijinsky danced the main part himself. As its score it used the Prélude à l'après-midi d'un faune by Claude Debussy. Both the music and the ballet were inspired by the poem L'Après-midi d'un faune by Stéphane Mallarmé. 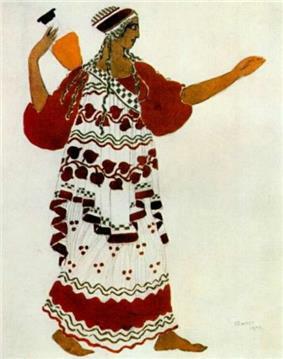 The costumes and sets were designed by the painter Léon Bakst. 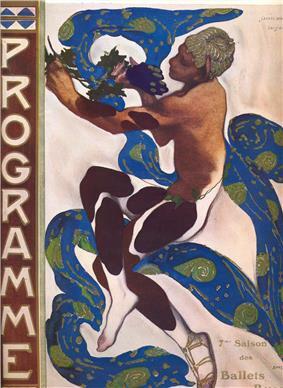 L'Après-midi d'un Faune is considered one of the first modern ballets and proved to be as controversial as Nijinsky's Jeux (1913) and Le Sacre du printemps (1913). The original idea was developed by Diaghilev, Nijinsky and Bakst and was inspired by the artwork on ancient Greek vases and Egyptian and Assyrian frescoes which they viewed in the Louvre museum. Bakst had already worked with Vsevolod Meyerhold, an innovative theatre producer and director who had introduced concepts like two-dimensionality, stylized postures, a narrow stage, pauses and pacing to emphasise significant moments, into his productions. Such concepts appear transferred to ballet in Faun. Nijinsky was an exceptional dancer, but he was not an exceptional teacher. Throughout the development of all his ballets he had difficulty explaining to others what he needed them to do, and operated by demonstrating rather than explaining. He had difficulty accepting the limitations of others, expecting them to be able to perform as well as he. Bronislava acted as his guinea-pig, trying out dances and positions. "I am like a piece of clay that he is moulding, shaping into each pose and change of movement... Vaslav is unwilling to realize the tremendous distance separating his vision from the means that are at the disposal of the artist." His aim was to reproduce the stylised look of the ancient artworks on the stage. 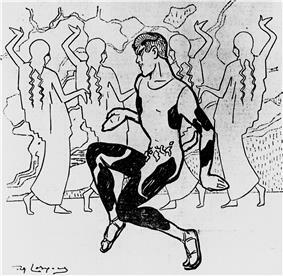 In his portrayal of the faun, Nijinsky managed to reproduce exactly the figure of a satyr shown on Greek vases in the Louvre. Nijinsky and his sister gave a first showing of the work so far to Diaghilev and Bakst in St. Petersburg at the start of 1911. However, its development was kept secret until Diaghilev was ready to stage it, for fear of offending Fokine. The company was relying on Fokine for other ballets in production and planned, and as matters turned out, justifiably thought he might walk out if his position as undisputed choreographer to the company was challenged. The régisseur, Grigoriev, was let into the secret in early 1912 and in March rehearsals began with other members of the company. Fokine resented the loss of rehearsal time for his own productions, attacked Nijinsky's incompetence at getting across his own ideas, claimed he only had the job because he was Diaghilev's lover and announced his intention to resign. Igor Stravinsky, whatever he thought of Nijinsky's ability, regretted that Fokine would be choreographing music he had just completed for Le Sacre du Printemps because he thought Fokine had run out of ideas. The 12 minute ballet required 90 rehearsals, in one respect justifying Fokine's complaints. However, all the dancers suffered the same difficulties Bronislava had reported in trying to adapt to the strange new movements which felt completely unnatural, cutting across their training. By this time Nijinsky had fully devised exactly what he wanted each dancer to do, so it was at least only necessary to train them, without having to work on developing the ballet at the same time. The general view amongst the dancers was that he was mad and the ballet was doomed to failure. Even Diaghilev started to have doubts and asked Nijinsky whether there might be changes. Now Nijinsky threatened to resign. On 28 May an invited audience attended the dress rehearsal. There was silence as it finished. Gabriel Astruc (a French impresario who assisted Diaghilev with finance, publicity and bookings) came on stage and announced that the ballet would be repeated. This time there was some applause before the audience was presented champagne and caviar in the theatre foyer. On the opening night the ballet was met with a mixture of applause and booing, and again it was repeated. Now the audience applauded, and Auguste Rodin in the audience stood up to cheer. "Nijinsky adopted the choreography of Debussy's work with an absolute sincerity, after having meditated for a long time on the subject and saturating himself with the atmosphere of the tableau painted by the composer... Nijinsky obtained... a fusion more intimate, more perfect, a more direct cohesion between the various elements of the music and the movements which express them." Anyone who mentions the words 'art' and 'imagination' in the same breath as this production must be laughing at us. This is neither a pretty pastoral nor a work of profound meaning. We are shown a lecherous faun, whose movements are filthy and bestial in their eroticism, and whose gestures are as crude as they are indecent. That is all. And the over explicit miming of this mis-shapen beast, loathsome when seen full on, but even more loathsome in profile, was greeted with the booing it deserved. M. Nijinsky ...took his revenge a quarter of an hour later with an exquisite rendering of 'Le Spectre de la Rose' so delightfully conceived by M.J-L Vaudoyer. That is the sort of show to give the public. Diaghilev responded by writing to Le Figaro forwarding letters of support, which Le Figaro published the following day. The painter Odilon Redon, friend of Mallarmé, suggested how much the author of the original poem on which the works had been based would have approved, "more than anyone, he would have appreciated this wonderful evocation of his thoughts." "Nijinsky has never been so remarkable as in his latest role. No more jumps - nothing but half-conscious animal gestures and poses. He lies down, leans on his elbow, walks with bent knees, draws himself up, advancing and retreating, some-times slowly, sometimes with jerky angular movements. His eyes flicker, he stretches his arms, he opens his hands out flat, the fingers together, and as he turns away his head he continues to express his desire with a deliberate awkwardness that seems natural. Form and meaning are indissolubly wedded in his body, which is totally expressive of the mind within... His beauty is that of antique frescoes and sculptures: he is the ideal model, whom one longs to draw and sculpt. The dispute spread, taking on a political tone as Le Figaro was accused of attacking the Ballets Russes because it opposed the political policy of France allying with Russia, and this represented an opening to smear all things Russian. The Russian ambassador became involved, French politicians signed petitions and a government commission was asked by President and Prime Minister to report. The Paris police attended the second night of the ballet because of its alleged obscenity, but took no action in view of public support. The ending of the ballet may, or may not, have been temporarily amended to be more proper. Tickets to all performances were sold out and Parisians clamoured to obtain them by any means. Fokine claimed to be shocked by the explicit ending of Faun, despite at the same time suggesting the idea of the faun lying down in a sexual manner on top of the nymph's veil had been plagiarised from his own ballet Tannhäuser, where the hero had lain down in a comparable manner upon a woman. However, Fokine found some points to compliment in the ballet, the use of pauses by the dancers where traditionally there would have been continuous movement, and the juxtaposition of angular choreography with the very fluid music. Fokine's animosity to Faun is partly explainable by his own difficulties in preparing Daphnis and Chloe, which was to premiere the week following Faun, and was not complete. Diaghilev tried to cancel Daphnis but in the event it was postponed to 8 June and only received two performances, when it was considered a success even by Le Figaro. The company was sharply divided into two factions by the quarrel, some supporting Nijinsky and some Fokine and the final result was that Fokine left the company on bad terms with Nijinsky, when the partnership of Nijinsky as dancer and Fokine as choreographer had been enormously successful for them both. 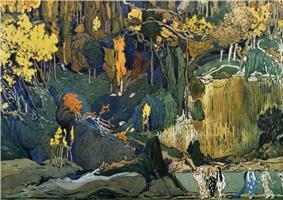 The stage setting by Léon Bakst was more impressionist than representational. The backcloth mirrored the fluidly flowing music by using splashes of muted greys, browns and greens to suggest the scene rather than define it precisely. It was hung at the line of the second wings rather than the back of the stage to deliberately narrow the performance space. The stage floorcloth was black as far back as the mound which the faun lies upon, and then green to the back of the stage. The lighting was designed to emphasise the flattened look of the dance. By contrast, the dancers costumes were designed to stand out. 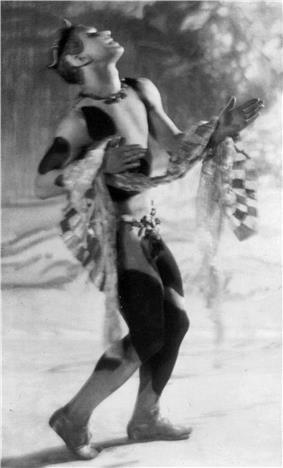 Nijinsky wore a cream body suit with brown piebald patches, as might be seen in the coat of an animal. To this were added a short tail, a belt of vine leaves and a cap of woven golden hair surrounding two golden horns giving the impression of a circlet. His ears were extended with wax to be more pronounced and pointed while overall his makeup was designed to make his face appear more animal. The nymphs wore white muslin, long pleated tunics decorated with stencilled patterns in blue or rust red. Some had checkered borders, others wavy lines or leaves. They had little makeup, except that their eyes were painted in pale pink, but wore tight wigs of golden rope which hung down in long strands. The faun and senior nymph wore golden sandals, the rest had bare white feet with rouged toes. Much of the movement takes places with groups of dancers passing each other in parallel lines, as if in a moving frieze. 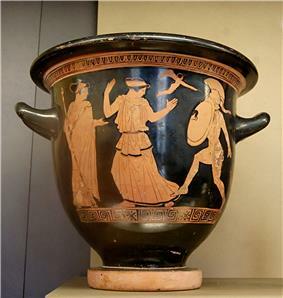 As the focus of attention passes from one group to another, dancers take a stylised pose as might be seen on an ancient vase and become still. The music is suggestive of a languorous summer's day in some exotic clime, and matching it the dancers move steadily and languorously too. The ballet starts with the sound of a flute, as the curtain rises to show the Faun lying on his mound, supported with his left arm while his right holds the flute to his lips. The faun eats from first one and then another bunch of grapes, holding them to his face, moving in a stylised angular way but also suggestive of the movements of some animal, as the flute music is now joined by horns and a rippling harp. As the flute tune repeats for the third time three nymphs walk on from the left with synchronised stylised movements, then two more moving in unison but differently from the first group. They perform a long arabesque to music from two flutes and harp, joined by strings as it progresses, while a sixth nymph walks to centre stage and holds a pose before joining the pair. The six nymphs freeze as the last nymph enters with a mechanical walk across the stage, letting fall her outer veils to reveal a short golden garment beneath. The nymphs all begin to move, the tableau on the stage being a group of three, a group of two, and a single nymph who sometimes joins the pair to balance the scene, sometimes strikes poses at variance to the pair. The Faun remains motionless as the first six nymphs enter, but then follows the progress of the last nymph with his eyes. A clarinet starts to play as his head begins to move and he rises to his feet as a cello joins in. The six nymphs have begun to bathe the new arrival, moving in and out, kneeling and rising with stylised, angular movements with elbows turned out from their sides, hands pointing at waists or to the sky, accompanied by an oboe. Violins build up the music as the Faun descends from his mound and the tempo increases. The pair of nymphs depart to the left of stage carrying one of the discarded veils, the first three nymphs carry off a second veil to the left. The music changes to a soulful clarinet solo. The sixth nymph who had been left isolated centre stage suddenly notices the faun behind her and runs off to the left, hands in air. Faun and last nymph are alone on stage as the music changes with a new air of excitement from the woodwind section, building with violins and harp. The Faun approaches the nymph with bursts of movement and the two dance around each other in a stand-offish courting display. He executes his only jump in the ballet, across an imagined stream issuing from a waterfall shown on the backdrop. The music becomes louder as the nymph becomes more enthusiastic, then subsides again as finally they link arms, but she breaks away and exits flat footed to the left. The Faun watches her go, first disappointed then smiling, then turns back to her discarded veil. To a solo violin backed by horns, flute and clarinet, the Faun throws back his head and bares his teeth, laughing, and takes the veil. He examines it with great delight accompanied by harp and flute which now repeat his opening tune. The woodwind brings in staccato chords as the three nymphs return from left and challenge the faun, who falls back from their advance. The music changes with an oboe taking up the tune as the nymphs turn back offstage again, hands in the air. The faun examines the veil, holding it in the air against his head until the cor anglais and flutes accompany the pair of nymphs as they enter from left, who challenge the faun with flapping arms, followed by the lagging sixth nymph coming in and doing the same just as the pair turn to leave. The faun falls back exchanging stares with the nymphs before the last nymph breaks off and she too retires. The Faun is now alone, he nods his head over the veil and returns to his mound. Cello and flute carry the tune with the harp continuing in the background. The Faun holds the veil to his face before spreading it on the ground and lowering his body onto it, head tucked in and arms to his sides. Soft horns and harp accompany a final flute passage as his body tenses and curls back, head rising, before relaxing back onto the veil. Nijinsky as the faun was thrilling. Although his movements were absolutely restrained, they were virile and powerful and the manner in which he caressed and carried the nymph's veil was so animal that one expected to see him run up the side of the hill with it in his mouth. There was an unforgettable moment just before his final amorous descent upon the scarf when he knelt on one leg on top of the hill; with his other leg stretched out behind him. Suddenly he threw back his head, opened his mouth and silently laughed. It was superb acting. Faun was premiered on 29 May 1912 at the Théâtre du Châtelet in Paris. 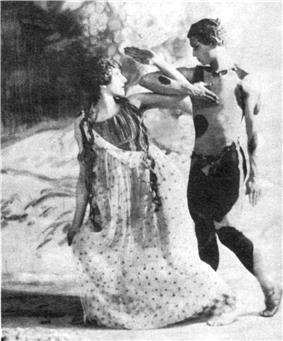 The faun was danced by Vaslav Nijinsky, senior nymph by Nelidova; Bronislava Nijinska danced the 6th nymph. The conductor was Pierre Monteux. It was felt better not to show 'faun' in the London season immediately following its Paris appearance, which in any event included showings of L'Oiseau de feu, Narcisse and Thamar for the first time in London. In the autumn a German tour began at the Stadt-Theater in Cologne on 30 October, moving to the New Royal opera House in Berlin for a programme including Faun on 11 December before the Kaiser, the King of Portugal and sundry dignitaries. Diaghilev reported to Astruc, Faune encored. Ten calls. No protests...press enthusiastic...huge success. Serge Gregoriev, who had just resigned from the Mariinsky theatre to join Diaghilev full-time as stage manager, was more sanguine, reporting that faun fell flat, but he confirmed the overall success of the German tour. Due to its hostile reception the ballet was only in the repertoire for a few years before being forgotten and assumed lost. In the late 1980s, dance notation specialists Ann Hutchinson Guest and Claudia Jeschke reconstructed the ballet from Nijinsky's own notebooks, his dance notation and the photographs of the dancers that were made by Baron Adolph de Meyer shortly after the first performance. This reconstructed version is often presented with Nijinsky's other works or repertoire from the Ballets Russes. The nymph dance in the dream sequence of the Charlie Chaplin film Sunnyside (1919) has been recognized as being a tribute to the ballet. A pastiche of the ballet forms part of the music video for Queen's 1984 single I Want to Break Free. Freddie Mercury dances the role of the faun, with dancers from the Royal Ballet also performing, including Jeremy Sheffield. This version also proved controversial in the US. ^ a b Le Figaro, 30 May 1912, Un Faux Pas Gaston Calmette editorial, cited in Buckle, Nijinsky, p.242. 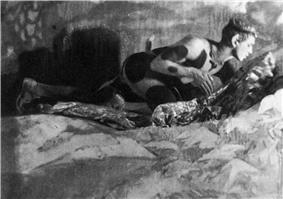 Buckle suggests Calmette was seeking to imply Nijinsky was showing bulging genitalia when seen in profile. ^ Chaplin, Lita Grey; Vance, Jeffrey (1998). Wife of the Life of the Party: A Memoir. Lanham, Maryland: Scarecrow Press. p. 24. Caddy, Davinia (2012). The Ballets Russes and Beyond: Music and Dance in Belle-Époque Paris. Cambridge university press. Ostwald, Peter (1991). Vaslav Nijinsky, a leap into madness. London: Robson Books Ltd.
Meyer, Adolf (1914). L'après-midi d'un faune. Paris. L'après-midi d'un faune. London: Dance Books Ltd.
Parker, Derek (1988). Nijinsky: God of the Dance. Wellingborough, England: Thorsons Publishing Group.